First and most importantly! Even before having any optic equipment and experience. Give it a try! See if you get to spot different species with the naked eye. And notice if it’s an exciting experience for you. 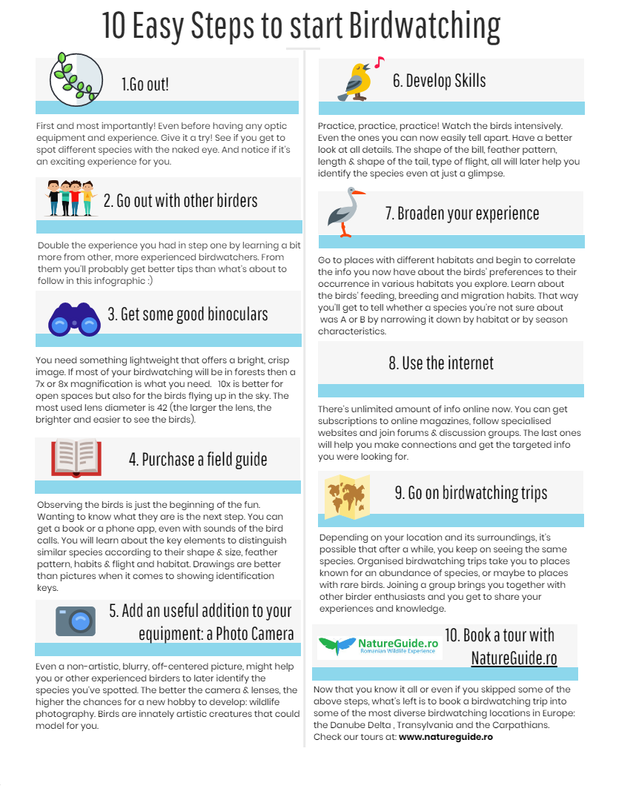 Double the experience you had in step one by learning a bit more from other, more experienced birdwatchers. From them, you’ll probably get better tips than what’s about to follow in this infographic 🙂 . With so many brands and models there’s a lot to choose from according to your budget. You need something lightweight that offers a bright, crisp image. If most of your birdwatching will be in forests then a 7x or 8x magnification is what you need . 10x is better for open spaces but also for the birds flying up in the sky. The most used lens diameter is 42 (the larger the lens, the brighter and easier to see the birds).If your budget allows it, you can look for further characteristics like: lens coating (ED/EL/HighLux/AquaDura etc. ), argon-purged-chamber, lifetime warranty and other details. Observing the birds is just the beginning of the fun. Wanting to know what they are is the next step. You can get a book or a phone app, even with sounds of the bird calls. You will learn about the key elements to distinguish similar species according to their shape & size, feather pattern, habits & flight and habitat. Drawings are better than pictures when it comes to showing identification keys. Even a non-artistic, blurry, off-centered picture, might help you or other experienced birders to later identify the species you’ve spotted. The better the camera & lenses, the higher the chances for a new hobby to develop: wildlife photography. Birds are innately artistic creatures that could model for you. Practice, practice, practice! Watch the birds intensively. Even the ones you can now easily tell apart. Have a better look at all details. The shape of the bill, feather pattern, length & shape of the tail, type of flight, all will later help you identify the species even at just a glimpse. Go to places with different habitats and begin to correlate the info you now have about the birds’ preferences to their occurrence in various habitats you explore. Learn about the birds’ feeding, breeding and migration habits. That way, you’ll get to tell whether a species you’re not sure about was A or B by narrowing it down by habitat or by season characteristics. There’s unlimited amount of info online now. You can get subscriptions to online magazines, follow specialised websites and join forums & discussion groups. The last ones will help you make connections and get the targeted info you were looking for. Depending on your location and its surroundings, it’s possible that after a while, you keep on seeing the same species. Organised birdwatching trips take you to places known for an abundance of species, or maybe to places with rare birds. 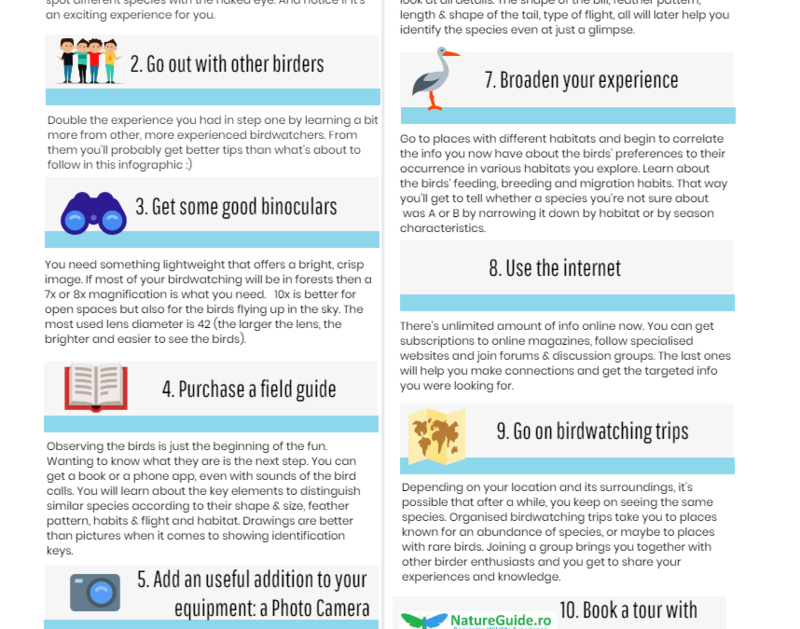 Joining a group brings you together with other birder enthusiasts and you get to share your experiences and knowledge.